Other hosts actually drive down tick numbers. Disease ecologist Rick Ostfeld and his colleagues at the Cary Institute have found that opossums are disastrous for black-legged ticks. Their immune systems kill off the pathogens that carry Lyme far more effectively than other species’ do, and they carefully groom their skin and devour any ticks they come across. 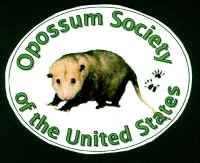 A single opossum may kill 5,000 ticks every week. See full article from Carl Zimmer’s ‘Rise of the Ticks’, April 13, 2013.